Do I have to complete homework in one sitting? Do I have to finish my LSAT homework? Can I come back to homework? When beginning a homework set, you'll be asked to choose your homework set size. You do not have to complete a homework set in one sitting, as you can always exit the set and return to it later on. Depending on the available time you have, you may want to select a larger homework set to get started, then come back and finish later. To exit a homework set, click the back arrow located in the upper left corner of the toolbar. This will pause the homework. Click Quit to exit the homework set. When you exit a homework set, the timer will pause and you will be returned to the homework page. You can come back to this page to Continue any incomplete homework sets later on. 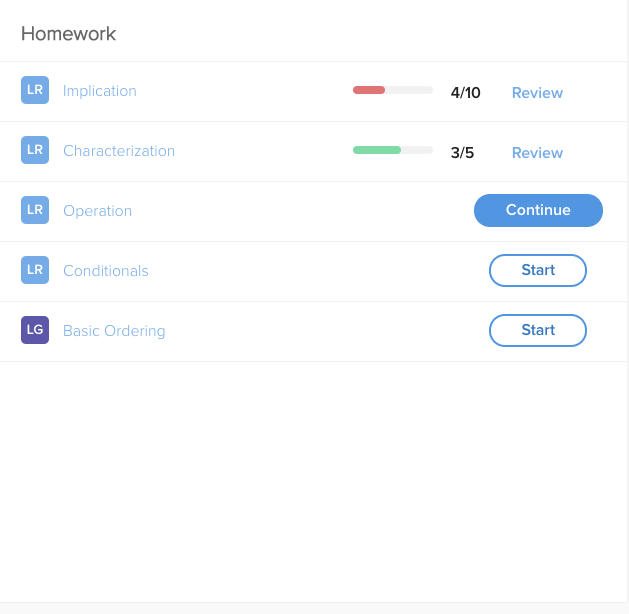 The Progress Bar on the Homework Overview page will also remind you which lessons have unfinished homework to come back to!